Family Life, in print since 1968, is one of the most widely-read Amish publications (circulation for 2010 was a reported 31,000). You won’t find Family Life in all Amish homes, but you will in many, if not a majority of Amish households. 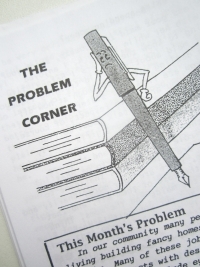 One of the most interesting parts of the periodical is a regular feature called “The Problem Corner”. It’s essentially an advice column where readers generate the answers to a question or issue posed by a fellow reader. “The Problem Corner” appears once every 2 or 3 months and features one question and usually 6-10 responses (and sometimes more). They are sometimes narrow issues, but more often general problems of wider concern. Questions may be directed to Amish readers, or more often, couched in a manner in which they can apply to all Christians. In past years “Problem Corner” issues have included natural remedies, gender imbalance in Amish settlements, reporting crimes to the authorities, multi-level marketing, and ministerial involvement in cases of domestic abuse. Since Family Life is read by Amish of many different affiliations, as well as Mennonites and non-Amish, the answers printed will vary, and there is not always (or even often) agreement on the best course of action. Thus you get a pretty good feel for the idea that there is rarely one “Amish opinion” on most issues outside of core beliefs like non-resistance and adult baptism. Since some letters are anonymous, you can’t always tell who the Amish respondents are, but you can often get an idea from the response itself. Frequently readers will share from their own experiences, especially if it is an issue with which they have also struggled. The idea of “Amish community” is something we often think of on the level of church and settlement. With “The Problem Corner” we have an example of Amish tapping into a wider “Amish community” which spans the magazine’s large readership. Interestingly it is one which also incorporates ideas from non-Amish, though often similarly-minded people. How much in US dollars for a yr subscription to Family Life? Still $12.00? I replied but not to your post. Sorry. The link did not remain highlighted either so I will post it again in hopes it does this tune! Renee, yes it is still $12.00. Here is the link and you can now order it online! If you have any interest in the other publications from Pathway, Young Companion (geared to youth/adolescents) and Blackboard Bulletin (teachers), you can get all three for around $25. They have a website and you can now ORDER online and make payment. I asked Mark about this. He said that he subscribes to all three Pathway Publications: Family Life; Young Companion; and Blackboard Bulletin. Also, he said that Pathway Publications publishes books, as well, and has a mail-order catalog bookstore. If you want to read some non-fictions or fiction that the Amish actually read, not Amish romance novels, you might want to send for Pathway’s catalog. I can get the address from Mark if anybody wants it. The periodicals have to be subscribed for in Aylmer, Ontario, Canada but the bookstore is in Indiana. Don, it would be wonderful to have the address where I could write to ask for a catalog from Pathway Publishers. If you don’t end up posting it here, you can please always e-mail me at sadie.troyer@aol.com. PS — A question for anyone: didn’t Ira Wagler’s father ( David? ) found “Family Life” magazine, then pass it onto Elmo Stoll? 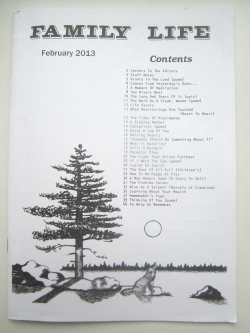 To receive a Pathway catalog, write to Pathway Publishers, 2580N 250W, LaGrange, IN 46761. Thank you, Erik! I appreciate it. Don I would like the address for the catalog. I think I like the idea of The Problem Corner, just judging by the examples here it seems like it is different from the famous and widely syndicated advice columnists as it appears as though the responses are written by real Amish and Mennonites for real A&Ms. I think issue example number one is a universal thing that, although maybe worded differently, everyone experiences from time to time. Don, I’d appreciate the address for the catalog, too. Thank you! I found the question about disciplining another’s child in their own home interesting, and also a concern among us “English”! And in the recent issue of Family Life the problem corner approached the issue of whether it was acceptable for women to shave hair from their chins or upper lips since “Women are not to cut their hair.” Interesting responses. So do Amish women remove underarm hair ? Carol, I have always wondered that myself. Also if they shave their legs. Anyone know? I know!! Most Old order women (in ohio! )Amish do not shave legs or under arms! I found this out from my best friend who is Old order and I aabout croaked when she actually showed me! Her dad is a bishop and husband a deacon and this is considered wordly and the hair was rightfully put there by God and should stay there. Now, we are Beachy AmishMennonite and rest assure we shave!!! So do the New Order. If we have face hair we wax it off. If a man in our church is required to shave his mustache then by George we are going to wax ours lol!! Stephanie, your post made me laugh!!! I love the way you phrased that last thought: “If a man in our church is required to shave his mustache then by George we are going to wax ours lol! !” LOLOL! I have a friend originally from Central Europe, and in her family at least, the women don’t shave. It’s just not part of her culture, and doesn’t bother her. To her, neither is more or less “attractive”, one is just a lot more work than the other! I wonder why most American women DO shave this way, and whether it is because of societal expectations, men’s expectations, or simply our own desire to do so. I wonder when and why it came the “norm” to do so, and why. I also wonder how many Amish women and girls living in districts where women’s shaving is prohibited ( or even living in other cultures who restrict it ) just shave anyway. I mean, other than a spouse or possibly immediate family, who would know the difference, when one is always going to be wearing at least short sleeves, fairly long dresses, and often opaque stockings? Maybe it would be noticeable in warmer months if someone went barefoot or such, but who is going to look that closely? Wait, maybe I don’t really want an answer to that! LOL. I think it’d be nice not to have to shave, personally. *grins* But here I am bordering on too much information, and think I’ll end this here, haha! There are ways around the shaving restrictions. One way is to burn away the hairs with the flame of a candle. I have heard tell of rolling something like an elastic band or twisted string or something over the legs to pull out the hairs, also of using lemon juice to make darker hairs more invisible. I suspect some women buy over the counter hair removal cream. At the end of the day, whether a woman shaves or not will be determined by her husband, if he is willing to accept it and turn a blind eye. Most men will for peace in the home. I’m sure that in the dark of night, hairy legs are less irksome than prickly legs. It is only in a society who runs around immodestly dressed that we will find a need for women to shave. I have noticed that secular men have also started to shave under their arms since it became acceptable for them to wear sleeveless vests in public. I wonder what people have against body hair? Daryl–I’d say that minimizing odor is certainly one reason that underarm shaving is done. Even the strongest anti-perspirant doesn’t eliminate what happens when bacteria mix with sweat.